Gamblers line up to place bets on the NCAA men's college basketball tournament Thursday at the Borgata casino in Atlantic City New Jersey. This is the first March Madness tournament since legal gambling expanded last year in the U.S.
March Madness is one of the most exciting times of the year for many sports fans, providing weeks of heroics and heartbreak on the college basketball court. But that’s not all the tournament brings to the table. According to the American Gaming Association, a group that advocates on behalf of casinos and other members of the gambling industry, this year’s March Madness tournament is expected to generate $8.5 billion in betting activity. Some of that activity will be through legal channels such as casino sportsbooks, with illegal bets going through other avenues such as bookies or offshore online sites. But while legal sports betting had long been constrained to the bright lights of Las Vegas and the state of Nevada, more and more states can now get in the game and, potentially, bring in additional revenue. For decades, federal law allowed sports gambling only in Nevada, banning it in all 49 other states. The Supreme Court, however, struck down that law last May and opened the door to sports betting across the country. Since then, seven additional states — Rhode Island, New Jersey, Pennsylvania, Delaware, West Virginia, Mississippi and New Mexico — have actively launched sports betting, according to the AGA. Maine is one of more than 20 other states actively considering a move to allow sports betting. Several proposals are in the works in Augusta, including a bill released recently by Rep. Jeffrey Evangelos, I-Friendship, and another still being drafted by Sen. Louis Luchini, D-Ellsworth, and Rep. Scott Strom, R-Pittsfield. Exploring this potential opportunity for new state revenue makes sense. But the Legislature should be in no rush as it considers ways to regulate and tax sports betting in Maine. Evangelos conceded he’s not sure how big of a windfall it could be for Maine, but sees it as “another source of revenue.” His bill would specifically funnel sports betting revenue toward education funding in Maine. Luchini, who chairs the Veterans and Legal Affairs Committee that will play a primary role in reviewing sports betting legislation this legislative session, is “certainly open” to allowing this type of gambling in Maine under the right regulatory structure. But he has a different idea for where the revenues should go. “I tend to favor putting it in the General Fund,” Luchini told the BDN, suggesting that approach would ensure any sports betting revenue is consistently part of future budget debates. Milton Champion, executive director of Maine’s Gambling Control Unit, which works with the Gambling Control Board to oversee casino gambling in the state, cautioned that he’s “a little skeptical” in terms of how much revenue sports betting could generate for the state. As he waits to see fiscal projections, however, he still thinks sports betting is a direction Maine should move in — if only to keep pace with other nearby states, and keep existing gambling revenue here in Maine. “I think it’s a good idea, because the competition is going to have it,” Champion explained, likening sports betting to another “amenity” that legal betting operations can offer to customers. 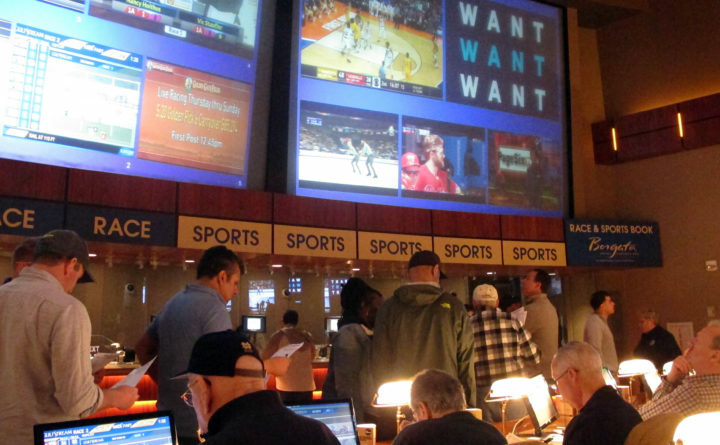 Other New England states are increasingly moving in the direction of allowing sports betting. Rhode Island already allows it, the New Hampshire House passed a bill last week, and both Connecticut and Massachusetts are similarly considering legislation. While the conversation here in Maine will of course include concerns about gambling’s societal impact, the fact is, we already allow betting on harness racing and at two existing casinos. “I think that train has left the station,” Evangelos told the BDN. He sees sports gambling “sweeping the nation” and wonders why Maine should be an outlier. We don’t disagree. But, as Champion correctly points out, Maine should take its time debating and devising a structure for regulation and taxation, considering the impacts, and learning from the successes and hurdles seen in other states already implementing sports betting. “There’s really not a hurry on this — we want to make sure we have the least amount of hiccups,” Champion stressed. It’s unclear what kind of odds these sports betting proposals will ultimately face as they work their way through Augusta. But as more states embrace sports gambling, the overall concept feels like a safe bet for the state.